In the culinary world of haute cuisine, these black nuggets are considered the "diamonds of the kitchen" for their unique earthy flavor and intoxicating aroma. The highly prized truffles have been used not only in savory dishes, but also as a decadent embellishment to ice cream and alcoholic cocktails. Visit our blog for archived posts including recipe ideas for your fresh truffles or any of our truffle products. At Keep Your Fork Farm, we grew specifically Black Winter Périgord Truffles (tuber melanosporum), which are named after the French region of Périgord. This variety of fungus is subterranean and grows near the foot of oak and hazelnut trees. Harvest season begins around December and can extend up to March. Generally, truffle sizes range from 1 to 7 ounces. 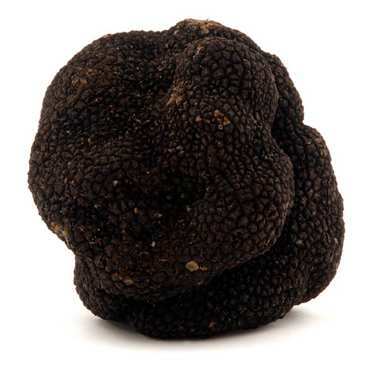 The black winter périgord truffle should not be confused with the white truffle (tuber magnatum), or the more affordable black summer or burgundy truffle (tuber aestivum/uncinatum), which are also prized for their culinary value. The burgundy truffles are harvested in the autumn and the summer truffles as they are named, harvested in the summer. Ideal conditions for truffles include good soil drainage, regular winter frosts and distance from other trees to prevent contamination from other fungi. In fact, it may take 8 years or more before truffle farmers enjoy their first harvest. When December arrives, farmers must use specially trained truffle-hunting dogs to search for these evasive culinary treasures. It is no wonder why these "black diamonds" are a rare treat.